"When I cannot write a poem, I bake biscuits and feel just as pleased." I drove past the Strathcona Stoneground Organics sign just down the road from my house quite a few times and each time I vowed that I would do some research into what they offered. What they offer is freshly ground (like ground after you call and say you want some fresh! ), wholegrain flour and baking mixes. I met Tammy, the lovely lady in charge of the Stone Burr Mill at Strathcona Stoneground Organics and took home a bag of their Whole Wheat Flour. 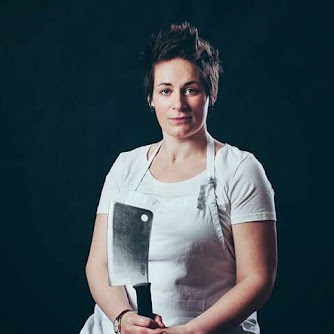 Strathcona Stoneground Organics is local Alberta food. 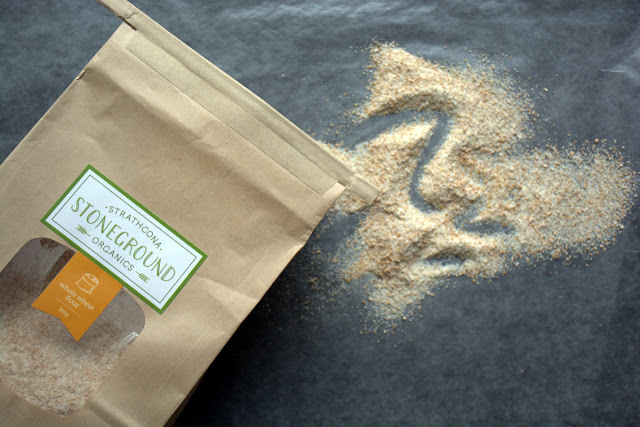 We take Certified Organic, GMO free grain and create flour & baking mixes that are jam packed full of flavor and nutrition. 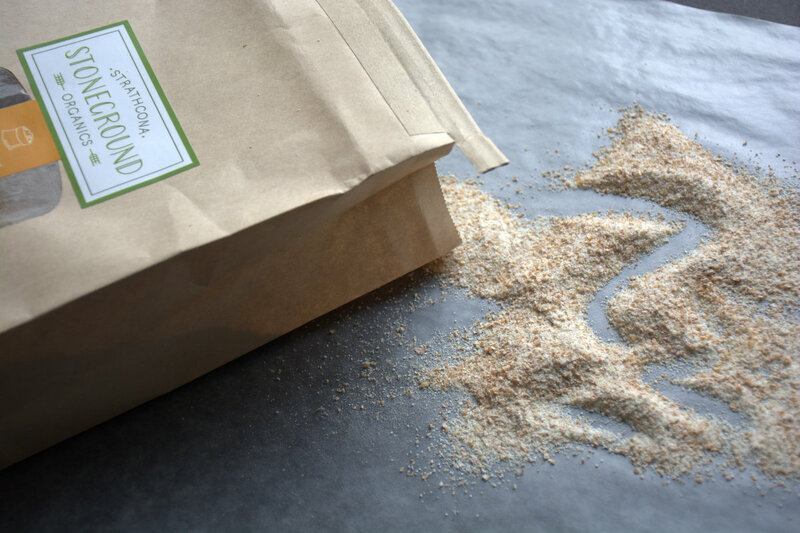 Our products are handmade FRESH to order here at our small stone burr mill, where our ingredient lists are short and pronounceable. 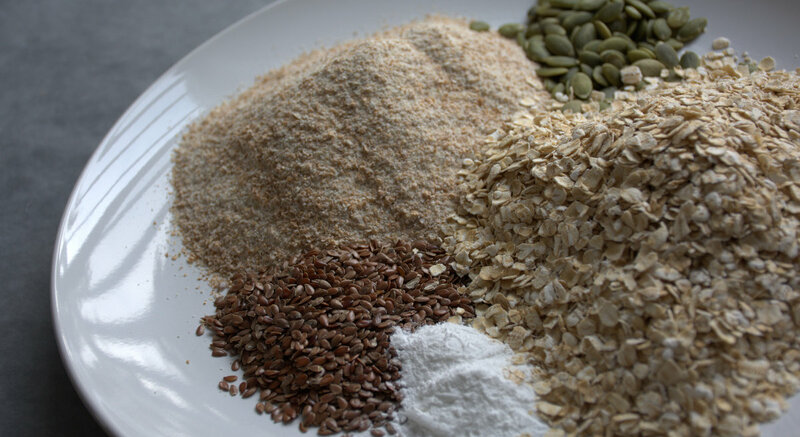 We use only the finest local ingredients to create the perfect blend of baking mixes and flour. If you purchase one of our products it will benefit YOUR health, our local farmers and our earth. The men of my house are all partial to the white bread rather than wholegrain and it's something I would like to try and change. I plan on using the Whole Wheat flour in lots of different bakes to try and convert my crew. I started with a very basic and traditional family recipe for oat biscuits. 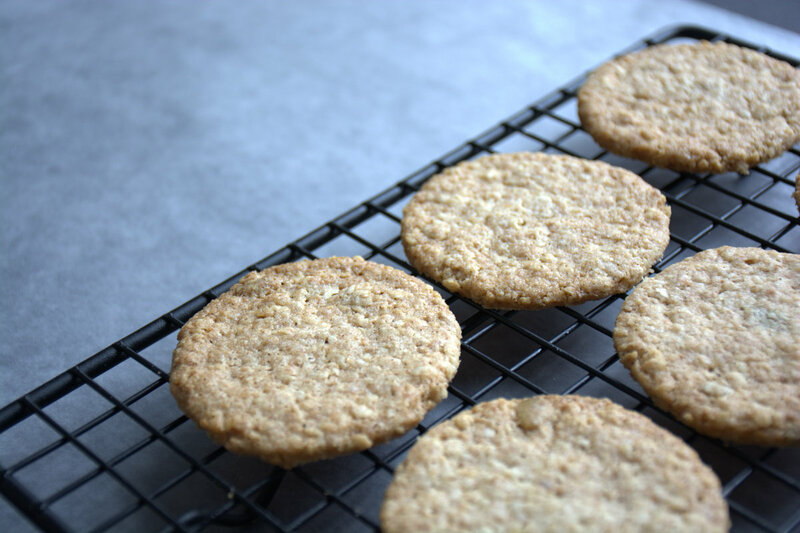 I took my Mum's recipe and played with the amounts of flour, baking powder and butter to get the perfect biscuit using the fabulous Whole Wheat Flour. Place all of the ingredients in a large bowl and rub in the butter till everything comes together. 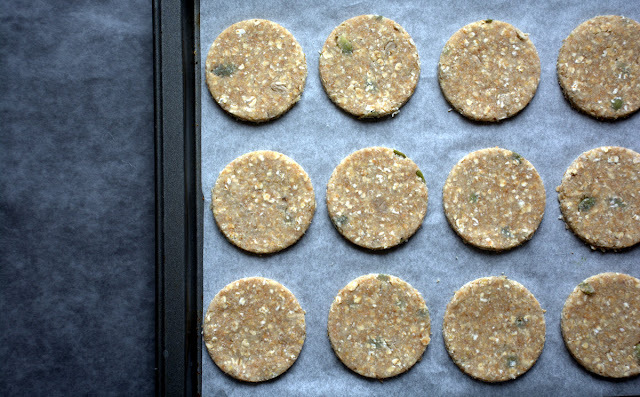 Cut the biscuits and lay them on a lined baking sheet. Leave each biscuit a little room to spread. Bake on the middle shelf of the oven for 15- 17 minutes. They should be a toasty golden brown colour. Transfer to a wire rack to cool. Ever wondered what goes into developing and testing a new recipe? My family have to endure many samplings of food with varying quantities of ingredients and most importantly different bake times. I once listened to an interview with Christina Tosi who is the chef, founder, and owner of Momofuku Milk Bar. She said that in baking, colour is flavour so don't be afraid to take it to the next level of taste by baking it just a little longer. In this case everyone agreed that a 17 minute bake was better than the 15! I will be posting more recipes using this fabulous local flour with bread being next on my list followed by some perfect afternoon tea scones with lashings of jam and cream. Don't forget to check out their products at the Organic Box or check out their web site here. Oats is very good to health as it has high levels of fiber content. 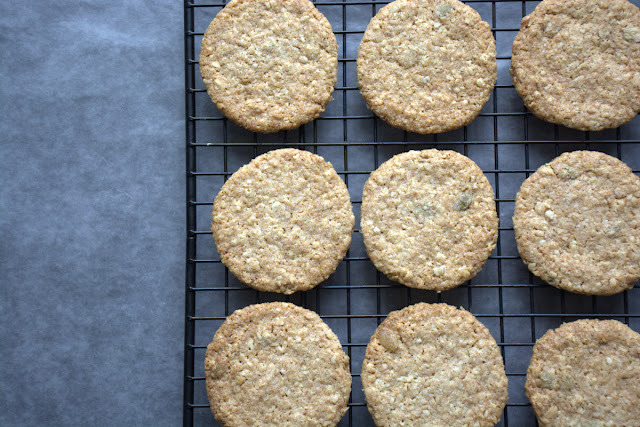 When you don't like to feel hunger for a long time, you can take foods made up of oats. You feel a "stomach-filled" sensation for a very long period (upto 6 hours maximum). 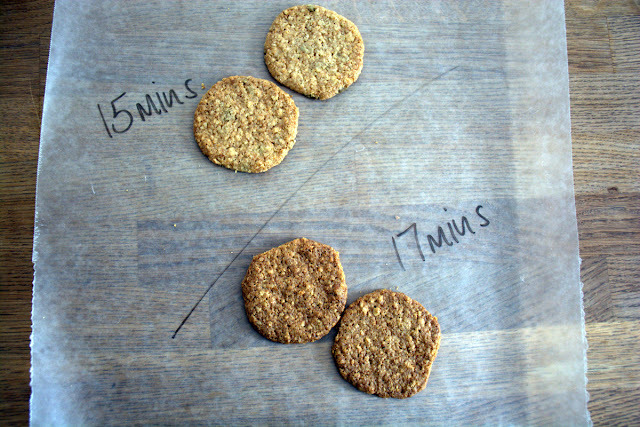 Oats are a whole grain.It may help with weight control.This post is useful to make a WHEAT SEEDED OAT BISCUITS.